The wrong anti-snoring pillow can aggravate your snoring problems and cause great discomfort as well. That is why it is imperative that you choose wisely and take every aspect of the product into consideration. This Nitetronic Pillow VS MyPillow comparison allows you to see exactly how good these two anti-snoring pillows are and which one of them is more likely to help you stop snoring. Nitetronic Goodnite Anti-Snore Pillow is an effective solution that uses sophisticated technology to reduce your snoring levels. It detects snoring and moves your head gently to the side, thus eliminating the causes of snoring in your throat and mouth. MyPillow is not an anti-snoring pillow, but it can help you sleep better and forget about the annoying neck pain and arm soreness. If your snoring problem is caused by an inadequate neck and head position, it may even help you snore less as well. Nitetronic Goodnite Pillow can last up to 4 years, but it may start losing its supportive properties after 1 year of regular use. Nitetronic Goodnite Pillow features a layer of comfortable foam over integrated air chambers designed to slightly nudge your head as soon as its sensors detect snoring sounds. The pillow also comes with a cotton pillowcase. With Nitetronic Goodnite Pillow, there is no adjustment period for snorers used to sleeping on foam pillows. If you are not used to foam pillows, however, it may take you 3 to 4 days to adjust to the product. Nitetronic Goodnite Pillow is clinically proven to reduce snoring up to 67%. The internal sensors of the pillow detect even the slightest snoring sounds and vibrations and start inflating the integrated air chambers to turn your head gently to the side, stimulate your throat muscles, and open your airways. Nitetronic Goodnite Pillow comfort cover can be removed and washed in your washing machine. The company recommends using your own pillowcase over the cover. DO NOT put the pillow itself in the washing machine as it features technology that could stop functioning properly if exposed to water. Nitetronic Goodnite Pillow has no known side effects. Nitetronic Goodnite Pillow comes with a 30-night trial period. If you are not satisfied with your pillow, you can contact the manufacturer within the trial period and receive a refund, minus a $50 restocking fee. The pillow must be returned undamaged and in its original packaging. Refunds are usually processed within 2 weeks. Nitetronic Goodnite Pillow comes with a 1-year limited warranty and covers defects in workmanship and materials when used in accordance with Nitetronic's guidelines. The warranty does not cover damage from misuse, abuse, and normal wear & tear. MyPillow products can last up to a decade without any structural deterioration or reduction in comfort. MyPIllow products feature a proprietary interlocking fill designed to give optimal support to your head, neck, and shoulders. The pillows are encased in a 100% cotton ticking, which provides users with unprecedented softness and comfort. With MyPillow, you choose between 5 different support levels and achieve optimal comfort from the start. The secret lies in the different types of filling used to create the best possible MyPillow for you. With MyPillow products, there is no adjustment period as you can simply order a pillow with a customized support level that can mimic any feather, down or foam pillow you used to sleep on. MyPillow is a patented sleeping pillow that keeps your neck perfectly aligned during the night. As a result, it keeps your airways open and prevents snore-inducing constrictions caused by improper head and neck alignment. It produces the best results in light to moderate throat snorers who sleep on the back or side. MyPillow should be washed every 4 months. If you have allergies, wash your pillow every 2 months. You can machine-wash and tumble-dry your pillow on a regular cycle with any detergent. However, you shouldn't use any fabric softeners or dryer balls. MyPillow products have no known side effects. If you are not happy with MyPillow, the company will give you a full refund, minus the shipping costs. Every pillow comes with a 60-day money-back guarantee starting from the date when you receive your order. Refunds usually take around 30 days to process from the moment MyPillow receives your returned item. MyPillow features a 10-year warranty on any material and/or workmanship defects. MyPillow will replace your defective item with a pillow of equal or greater value and cover all the shipping costs. I’d give it one star if I could. The worst. Initially, ok. A couple months in, so very lumpy and comfortable I threw them out. I got Beautyrest Black pillows (2 kings $19.99) and one year later still great. Don’t waste your money. Oh, and it did nothing for snoring. This pillow is just awesome! I've been using it for 3 months now and it didn't get all lumpy as my other pillows I bought in the past trying to combat my snoring and give myself a chance at a good night's rest. It molds to the shape of my head and neck and doesn't hold my head in a poor position like those other pillows. When I learned this pillow was made of memory foam I didn't expect much, so you can imagine my surprise when I woke up feeling refreshed and revitalized without any stiffness in my neck or back. I'm currently recovering from my C-3 cervical disc surgery and this pillow is just a godsend. The initial hype almost turned me away but hyped products sometimes actually do work. It does everything it says, but it’s still just a pillow, does not really do much snoring-wise. 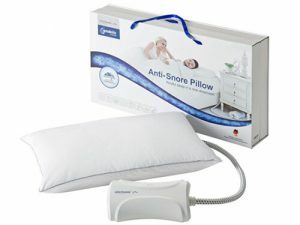 Nitetronic Goodnite Anti-Snore Pillow is one of the most effective anti-snoring pillows on the market. It can reduce your snoring levels as soon as you start using it. Learn all about this smart pillow in our Nitetronic Goodnite Anti-Snore Pillow review.